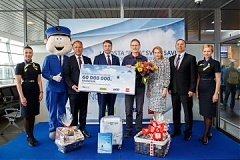 On Wednesday, 19 April, Riga International Airport solemnly welcomed its 60 millionth passenger since the restoration of independence. Curt Almquist arrived at the Airport with a flight from Stockholm operated by the national airline airBaltic. Northern Horizon Capital AS (the Management Company) announces the plan for next public offering of new units of Baltic Horizon Fund (the Fund) in May 2017, the Fund representatives informed BC. The Ambassador of Sweden to Latvia, Mr Henrik Landerholm and a delegation from the Swedish twinning city Klippan are visiting Limbaži on April 19. The program is full of meetings and visits. The Bank of Estonia says that the planned taxation of financial services may cause negative side effects to the financial stability of Estonia and undermine the funding of the economy. Last year, the most widespread reason for denying Latvian residence permits to foreigners seeking them in return for investments in the Latvian economy was suspicions that these persons might collaborate with foreign intelligence services, according to the Security Police said in a report for 2016 writes LETA. RAM experts: “Trumpflation” under question? Rietumu Group specialists have prepared a review of the profitability of investment funds of Rietumu Asset Management in March. The review includes an analysis of key economic indicators, the monetary policy. It provides comprehensive information on the situation on stock markets, bond, currency and commodity markets. The review is accompanied with extensive comments from the experts. The most modern office buildings in Riga will be built in Skanste neighborhood in the coming years, which will further contribute to the development of the neighborhood as well as the economic development of Riga and the entire country, according to the conclusions of a conference organized by the Riga City Council and Skanste Development Agency today.